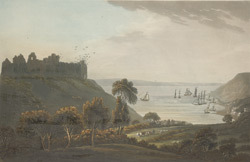 View of Oystermouth castle and village. Oystermouth is situated on the western side of Swansea Bay in South Wales. Oystermouth is sometimes known as the Mumbles because the area is better known for the Mumbles islands- 2 small islands which stand on the end of a promontory off the coast nearby. The castle is positioned at the top of a forty foot headland; it was founded in the 12th century by William de Londres and was originally a ringwork and baily structure. It was rebuilt in the 13th century from stone by the de Braoses family.